My total was $124.75.... but that included things like batteries ($15), shower cleaner ($3), 4 deodorants ($7), a patch for my daughter's pants ($2), etc. Once I take away all the non-food items, I actually spent just $82 on groceries. Right now I'm having my doubts that that's enough to get us through the month, but I'm going to do my best! My goal is for this to be the only big trip I do this month. I know we'll have to run for milk and fresh produce, and possibly bread, but otherwise, I want to try and just use what's currently in the freezer and pantry. Join the Pantry Challenge with Good Cheap Eats in January. 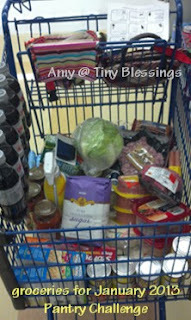 You can see my entire list of meals (so far) for the Pantry Challenge HERE. Hubs totally derailed my shopping trip - we've got more than enough to get through the month - just have to pick up milk, maybe eggs, and fresh veg as needed. We are joining in on the January challenge, too. I picked up a few basics (apples, potatoes, a few root veggies), but I didn't buy fresh produce (like salad type stuff) because this weekend we'll be going to the "big" town and I can buy things at a better price there. I'm hoping to not have to buy more until I go back to town on the 18th.